Having problems taking pictures with your Smartphone? When you click on your camera to take a picture do you only get a black screen? This isn’t a very common issue for Smartphones, but it sure can be troublesome. Usually when this happens the phone won’t be able to take a picture or record a video at all. This article will go over some of the possible causes as well as some possible solutions on how to try and get a smartphone’s camera to start working properly again. If encountered camera failure on Samsung Galaxy S3 GT-I9300, you may first restore or update the device firmware. If the problem doesn’t lie on the firmware, then try to replace the camera module and ensure that the flex ribbon cable is not damaged or already tried replacing it. The solution below shows the location of particular components that holds for camera and may caused the problem if become faulty or damaged. You may then check these components if both the camera module and the flex cable is okay. a) Try to replace a new camera replacement module. b) Check and clean the camera connector. c) Do supply voltage measurement on corresponding camera supply voltages (see solution above). You can check this voltages while trying to enable the camera in ON condition. 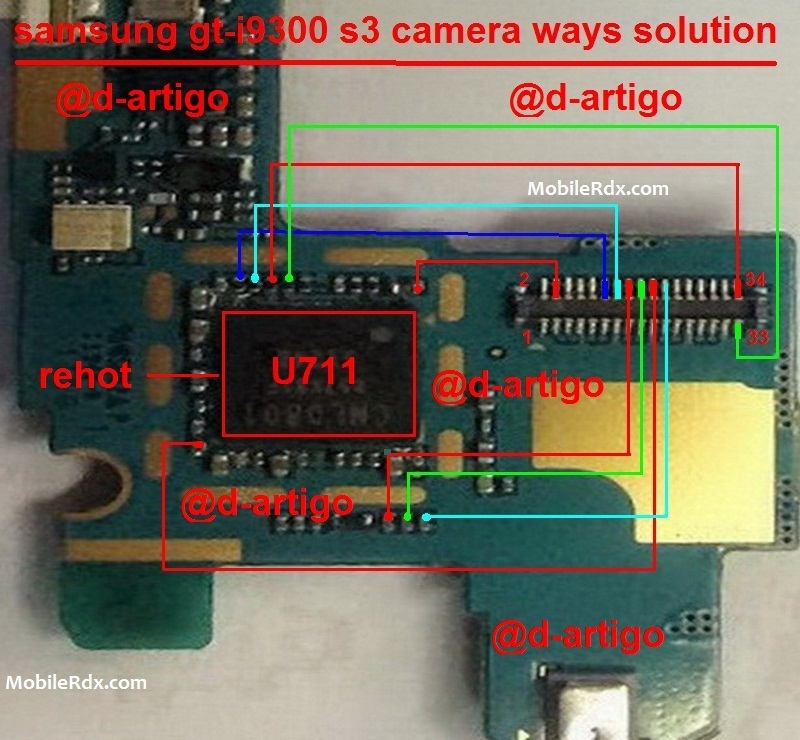 Samsung GT-I9300 Camera Connector Jumper, Camera Module Problem, Camera Jumper Ways.